In March 1992 Aldershot were declared bankrupt and as a result had to resign from the Football League. They had played 36 matches but those results were declared void. Vauxhall Conference champions Colchester United replaced Aldershot for the start of the 1992/93 season. Following their bankruptcy the club reformed as Aldershot Town and progressed through the non-league pyramid to regain their place in the Football League after finishing the 2007/08 season as Conference champions - 2007/08 Conference table and play-off results. Finishing bottom of the Football League Aldershot Town were relegated from the League along with Barnet, their places being taken by Blue Square Conference promoted clubs Mansfield Town and Newport County 2012/13 Conference table and play-off results. 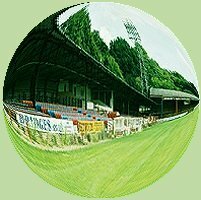 * Aldershot had one point deducted in the 1974/75 season for fielding an ineligible player - details.